Police broke up a sit-in protest in Lagos early Thursday, dispersing hundreds of former slum-dwellers demanding compensation after being evicted from their waterfront homes. 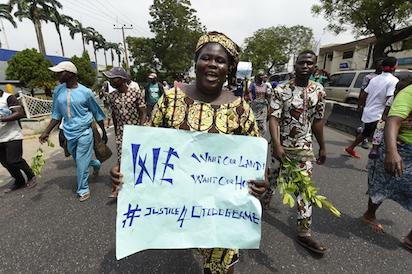 A woman holds a sign as she and other evictees of Otodo-Gbame, a Lagos shanty town, march to press for relief and resettlement in Lagos on November 15, 2017. Some 600 people from the Otodo-Gbame area of the Nigerian megacity, including women and children, had earlier on Wednesday marched to the office of the state governor. They were among more than more than 30,000 people made homeless in the last year, as part of a move by the city authorities to remove shanty towns. At least 11 people are said to have died and 17 others disappeared as the bulldozers moved in and residents were chased into the nearby lagoon. Earlier this week, Amnesty International published a report calling the evictions from the poor fishing community “unlawful” and demanded an investigation into the violence. The Justice and Empowerment Initiatives (JEI) lobby group said police moved in when protesters decided to stay the night at the rally with the hope of seeing the governor. “Just after midnight, the Lagos State Task Force stormed the protest ground and began beating the peaceful demonstrators,” said JEI founder Megan Chapman. “They brought three ‘Black Maria’ mobile detention vehicles and arrested many of the protesters, especially men. Amnesty International Nigeria researcher Morayo Adebayo gave a similar number while Raymond Gold, of the Nigerian Slum and Informal Settlement Federation, said “about 100” were held. “Some of them were wounded,” he told AFP. Lawyers were sent to secure their release, he added. The JEI said it condemned “in the strongest possible terms the use of force and unlawful arrest of peaceful protesters who have come out to demand justice and an end to forced evictions that plague the urban poor”. Lagos state police spokesman Olarinde Famous-Cole said he had no information about any arrests and confirmed only that Wednesday’s “dispersed at about 2:00 pm”. But he added that it would be “a breach of security for anybody to be found within the vicinity of the governor’s office without authorisation after office hours”. Otodo-Gbame used to lie between the upmarket Lekki Phase 1 are and the Elegushi housing estate, which is home to wealthy Nigerians. The evictees accuse the state government of conspiring with a prominent Lagos family to seize the land and sell it to the highest bidder. Lagos has a history of demolishing entire neighbourhoods. In 1990, the authorities demolished Maroko, a shanty town in the well-heeled suburb of Victoria Island, forcing some 300,000 people out of their homes. The post Police disperse evicted Otodo-Gbame shanty dwellers protest appeared first on Vanguard News.